Priyanka Chopra Jonas and Nick Jonas tied the knot in December 2018. Even today fans of the couple, across the globe, talk about the lavish affair. Be it fashionistas or the actress’ fans, nobody can get over Priyanka’s bridal avatar. And this black-and-white photo is no less than a dreamy one. 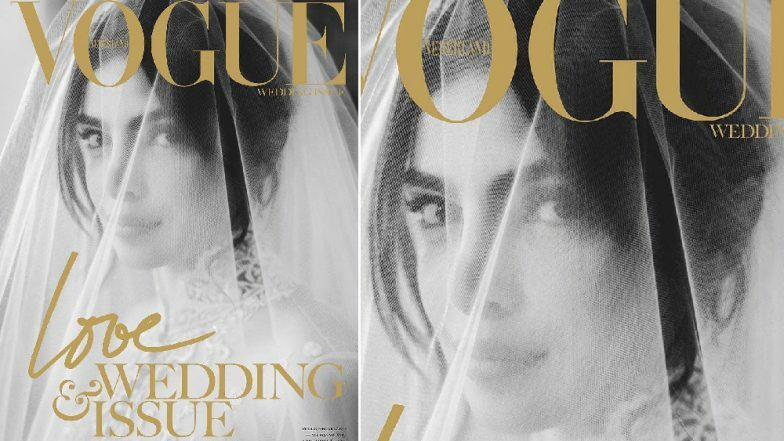 Priyanka has become the first cover girl of Vogue Netherlands’ Love & Wedding Issue. The picture, in which she is seen looking through her Ralph Lauren wedding veil, is breathtakingly beautiful. We are sure, you certainly agree with us. JSisters Priyanka Chopra Jonas, Sophie Turner, Danielle Jonas Give Us a Perfect Start to the Weekend With This ‘Cool’ Pic. Priyanka Chopra Jonas’ custom Ralph Lauren wedding gown is discussed in the fashion world today. Her look inspired many other brides-to-be. This lovely picture has been shot by photographer Jose Villa, who also captured the couple’s Christian wedding. While sharing the picture, the global icon captioned it, “My fairytale Thank you @nlvogue for making me your first cover girl of the Love & Wedding issue.” To this, the photographer has commented, “A dream to capture it all for you and @nickjonas”. These Pictures of Priyanka Chopra Jonas and Nick Jonas Holidaying in Miami Will Make You Instantly Jealous – View Pics. Priyanka Chopra and Nick Jonas’ wedding took place in both Hindu and Christian rites. The wedding festivities and the ceremonies was held at the Umaid Bhawan Palace. Families and close friends of the couple were seen in attendance. So what do you think of this stunning picture of Priyanka Chopra Jonas?